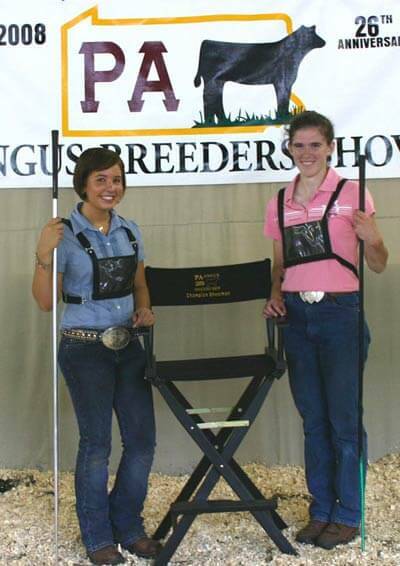 Kate Livingston, Dover, Pa., left, received the Bronze and Silver Awards at the 2008 Pennsylvania Angus Breeders Junior Show, July 3-5 in Huntingdon, Pa. The Bronze and Silver Awards are the first two levels of the NJAA recognition program. Youth must apply for the awards, based on their junior Angus activities and leadership involvement. David Mullins, Association regional manager, right, is presenting the awards. Photo by American Angus Association. 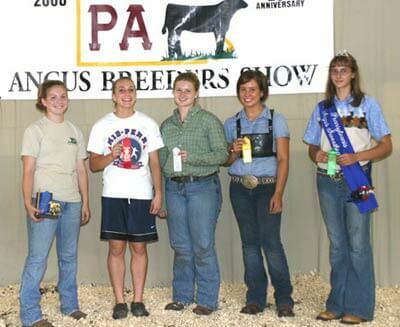 These juniors placed in the top five girls livestock judging contest at the 2008 Pennsylvania Angus Breeders Junior Show, July 3-5 in Huntingdon, Pa. Pictured from left includes Andrea Foore, Seven Valleys, Pa., first; Lindsay Upperman, Chambersburg, Pa., second; Kate Livingston, Dover, Pa., third; Alexis O'Boyle, Newport, Pa., fourth; and Elizabeth Trowbridge, Meshoppen, Pa., fifth. Photo by American Angus Association. 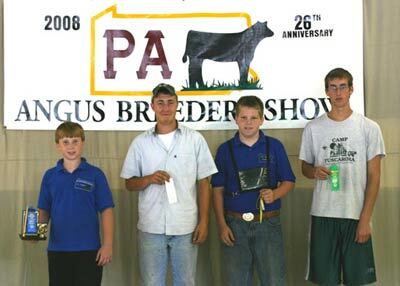 These juniors placed in the top five boys livestock judging contest at the 2008 Pennsylvania Angus Breeders Junior Show, July 3-5 in Huntingdon, Pa. Pictured from left includes Kyle Livingston, Dover, Pa., first; Richard Hannum, Oxford, Pa., third; Logan Foore, Seven Valleys, Pa., fourth; and Eugene Trowbridge III, Meshoppen, Pa., fifth. Photo by American Angus Association. 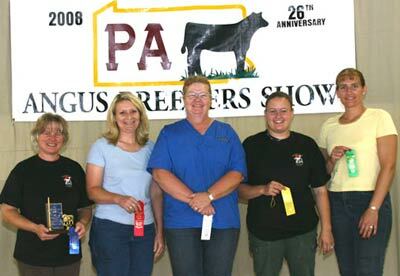 These ladies placed in the top five livestock judging contest at the 2008 Pennsylvania Angus Breeders Junior Show, July 3-5 in Huntingdon, Pa. Pictured from left includes Linda Hower, Bethlehem, Pa., first; Jane Upperman, Chambersburg, Pa., second; Deborah Spangler, Boswell, Pa., third; Jamie Brozman, Bethlehem, Pa., fourth; and Valerie Trowbridge, Meshoppen, Pa., fifth. Photo by American Angus Association. 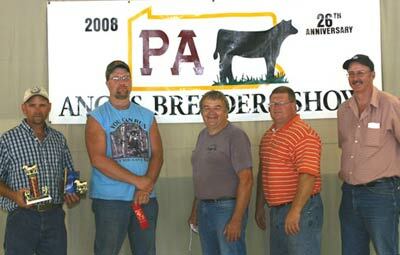 These men placed in the top five livestock judging contest at the 2008 Pennsylvania Angus Breeders Junior Show, July 3-5 in Huntingdon, Pa. Pictured from left includes Zebulon O'Boyle, Newport, Pa., first; Kevin Spangler, Boswell, Pa., second; Ned Hower, Bethlehem, Pa., third; Samuel Long, Airville, Pa., fourth; and Eugene Trowbridge II, Meshoppen, Pa., fifth. Photo by American Angus Association. 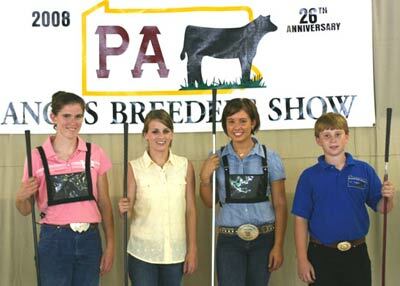 These junior members received showmanship honors at the 2008 Pennsylvania Angus Breeders Junior Show, July 3-5 in Huntingdon, Pa. Pictured from left includes Caitlin Fairbairn, Coatesville, Pa., senior champion; Hannah Grim, East Berlin, Pa., intermediate champion; Alexis O'Boyle, Newport, Pa., junior champion; and Kyle Livingston, Dover, Pa., novice champion. Photo by American Angus Association. 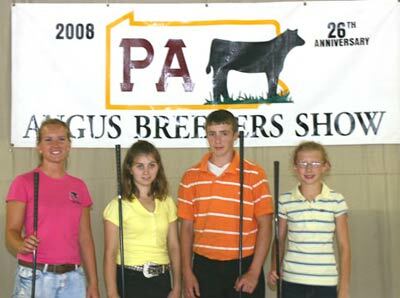 These juniors received showmanship honors at the 2008 Pennsylvania Angus Breeders Junior Show, July 3-5 in Huntingdon, Pa. Pictured from left includes Gwen Powers, Bethel, Pa., reserve senior champion; Amanda Thompson, Wellsville, Pa., reserve intermediate champion; Fred Frey, Quarryville, Pa., reserve junior champion; and Alysha Sweitzer, Wellsville, Pa., reserve novice champion. Photo by American Angus Association. 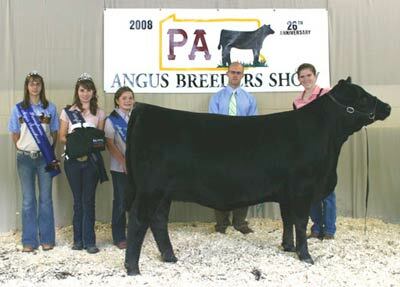 These junior members received showmanship honors at the 2008 Pennsylvania Angus Breeders Junior Show, July 3-5 in Huntingdon, Pa. Pictured from left includes Alexis O'Boyle, Newport, Pa., supreme champion; and Caitlin Fairbairn, Coatesville, Pa., reserve supreme champion. Photo by American Angus Association. 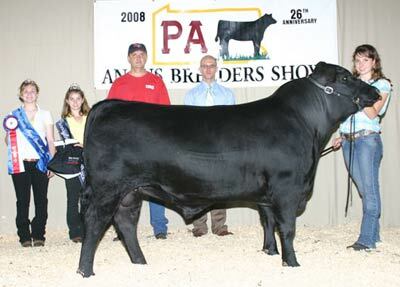 M V A Boyd Determinator 718 won grand champion bred-and-owned bull at the 2008 Pennsylvania Angus Breeders Junior Show, July 3-5 in Huntingdon, Pa. Valerie Coleman, Shirleysburg, Pa., owns the April 2007 son of Boyd New Day 8005. Adam Hayes, Kingwood, W.Va., evaluated the 87 entries. Photo by American Angus Association. 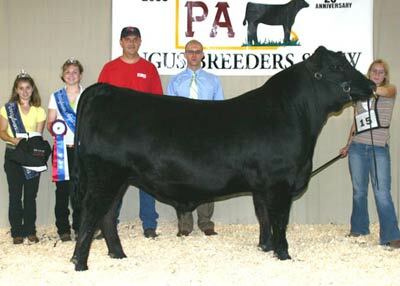 Freys KJF Top Dawg won reserve grand champion bred-and-owned bull at the 2008 Pennsylvania Angus Breeders Junior Show, July 3-5 in Huntingdon, Pa. Katrina Frey, Quarryville, Pa., owns the May 2007 son of W C C Developer R30. Adam Hayes, Kingwood, W.Va., evaluated the 87 entries. Photo by American Angus Association. 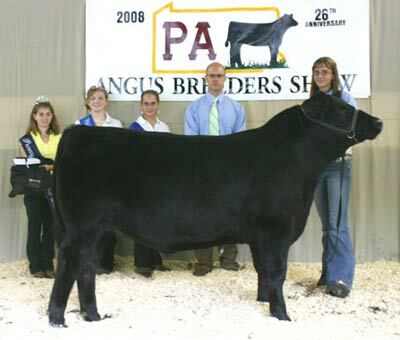 Freys KJF Ark Pride M35 S110 won grand champion bred-and-owned female at the 2008 Pennsylvania Angus Breeders Junior Show, July 3-5 in Huntingdon, Pa. Katrina Frey, Quarryville, Pa., owns the September 2007 daughter of Connealy Danny Boy. She first won senior calf champion. Adam Hayes, Kingwood, W.Va., evaluated the 87 entries. Photo by American Angus Association. 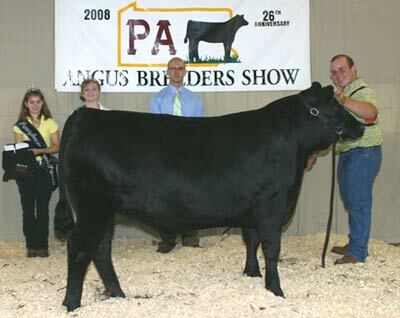 KML 413 Erica's Patty 712 won reserve grand champion bred-and-owned female at the 2008 Pennsylvania Angus Breeders Junior Show, July 3-5 in Huntingdon, Pa. Kyle Livingston, Dover, Pa., owns the April 2007 daughter of TC Freedom 104. She first claimed junior champion. Adam Hayes, Kingwood, W.Va., evaluated the 87 entries. Photo by American Angus Association. 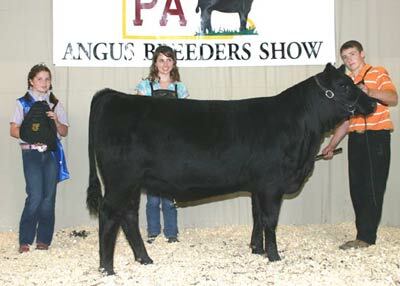 Woodland Tibbie 207 won bred-and-owned reserve junior champion heifer at the 2008 Pennsylvania Angus Breeders Junior Show, July 3-5 in Huntingdon, Pa. Andrea Foore, Seven Valleys, Pa., owns the winning heifer. Photo by American Angus Association. 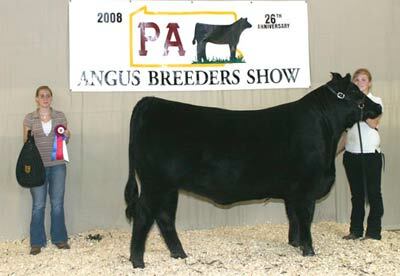 Freys KJF Ark Pride M35 S107 won bred-and-owned reserve senior heifer calf champion at the 2008 Pennsylvania Angus Breeders Junior Show, July 3-5 in Huntingdon, Pa. Katrina Frey, Quarryville, Pa., owns the winning heifer. Photo by American Angus Association. 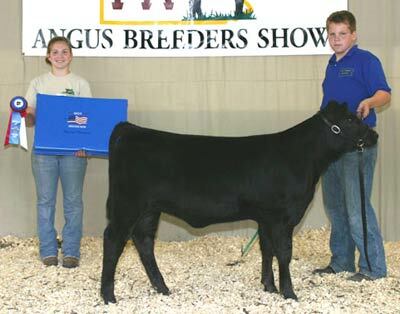 Freys KJF Delia M90 T26 won bred-and-owned junior heifer calf champion at the 2008 Pennsylvania Angus Breeders Junior Show, July 3-5 in Huntingdon, Pa. Katrina Frey, Quarryville, Pa., owns the winning heifer. Photo by American Angus Association. 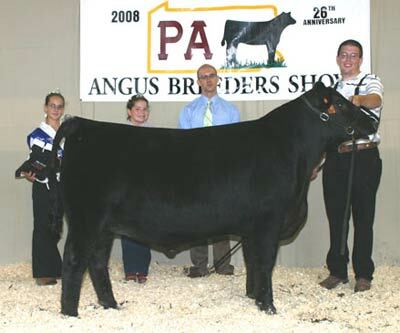 UHA Dream Catcher 722 018 won bred-and-owned reserve junior heifer calf champion at the 2008 Pennsylvania Angus Breeders Junior Show, July 3-5 in Huntingdon, Pa. Lindsay Upperman, Chambersburg, Pa., owns the winning heifer. Photo by American Angus Association. 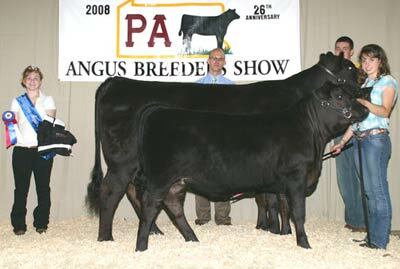 CRW Marguerita 6620 won grand champion owned female at the 2008 Pennsylvania Angus Breeders Junior Show, July 3-5 in Huntingdon, Pa. Alexis O'Boyle, Newport, Pa., owns the July 2007 daughter of G A R Grid Maker. She first won intermediate champion. Adam Hayes, Kingwood, W.Va., evaluated the 87 entries. Photo by American Angus Association. 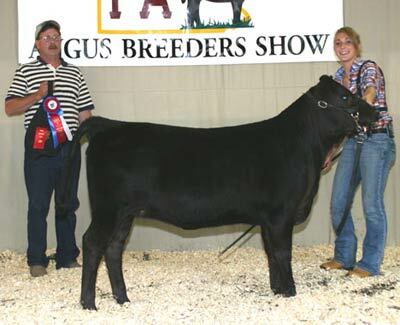 Rains Sweet Dream GTHP won reserve grand champion owned female at the 2008 Pennsylvania Angus Breeders Junior Show, July 3-5 in Huntingdon, Pa. Caitlin Fairbairn, Coatesville, Pa., owns the March 2007 daughter of TC Grid Topper 355. She first claimed junior champion. Adam Hayes, Kingwood, W.Va., evaluated the 87 entries. Photo by American Angus Association. 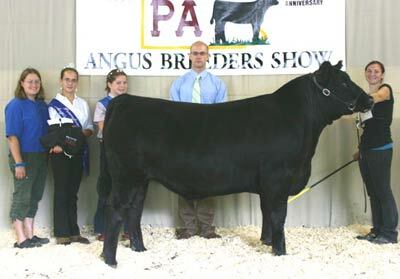 Weaverland Blackbrd Danica won owned senior champion female at the 2008 Pennsylvania Angus Breeders Junior Show, July 3-5 in Huntingdon, Pa. Cale Grimes, Genesee, Pa., owns the winning female. Photo by American Angus Association. 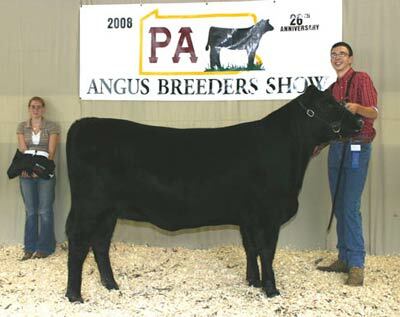 Gambles Elba 9176 won owned reserve senior champion female at the 2008 Pennsylvania Angus Breeders Junior Show, July 3-5 in Huntingdon, Pa. Ryan Fairbairn, Coatesville, Pa., owns the winning female. Photo by American Angus Association. 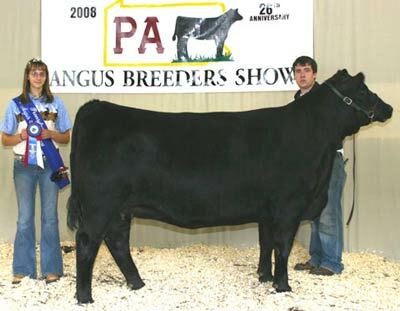 Sherwood Rosebud 757T won owned reserve junior champion heifer at the 2008 Pennsylvania Angus Breeders Junior Show, July 3-5 in Huntingdon, Pa. Lacey Murray, Garrett, Pa., owns the winning heifer. Photo by American Angus Association. 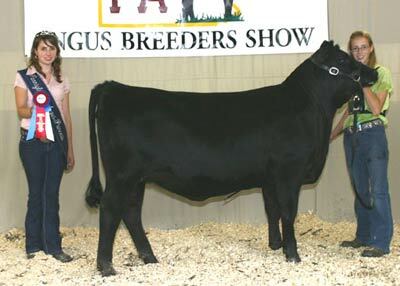 DCC Precisely Belle 713 won owned senior heifer calf champion at the 2008 Pennsylvania Angus Breeders Junior Show, July 3-5 in Huntingdon, Pa. Shelby Dean, New Castle, Pa., owns the winning heifer. Photo by American Angus Association. 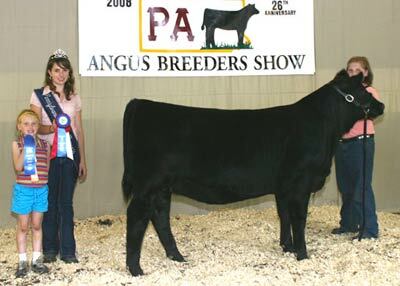 SHEN-VAL 1961 7V01 Desire won owned reserve senior heifer calf champion at the 2008 Pennsylvania Angus Breeders Junior Show, July 3-5 in Huntingdon, Pa. Alana Eisenhour, Wellsville, Pa., owns the winning heifer. Photo by American Angus Association. 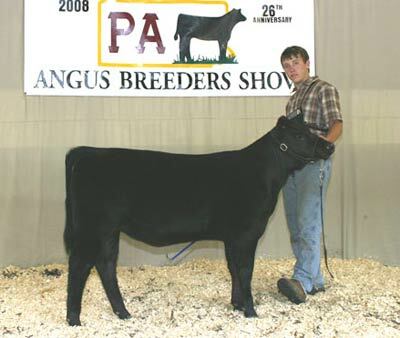 Woodland Edella 398 won owned junior heifer calf champion at the 2008 Pennsylvania Angus Breeders Junior Show, July 3-5 in Huntingdon, Pa. Logan Foore, Seven Valleys, Pa., owns the winning heifer. Photo by American Angus Association. 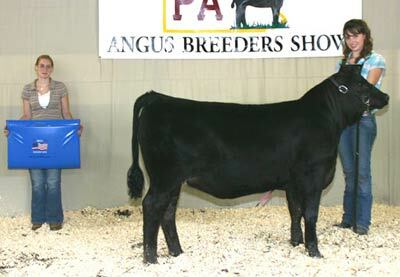 SMB Pearl of Rito 2 878 won owned reserve junior heifer calf champion at the 2008 Pennsylvania Angus Breeders Junior Show, July 3-5 in Huntingdon, Pa. Casey Kelly, Nottingham, Pa., owns the winning heifer. Photo by American Angus Association. 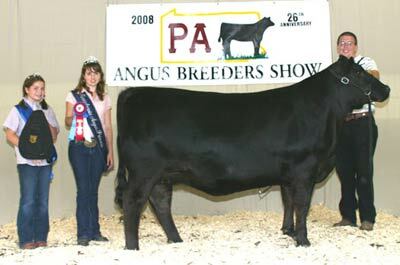 K J F Delia K48-M90 won grand champion cow-calf pair at the 2008 Pennsylvania Angus Breeders Junior Show, July 3-5 in Huntingdon, Pa. Katrina Frey, Quarryville, Pa., owns the April 2003 daughter of T O F Famous F05 K26. A January 2008 heifer calf sired by G 13 Stand Out is at side. Adam Hayes, Kingwood, W.Va., evaluated the 87 entries. Photo by American Angus Association. 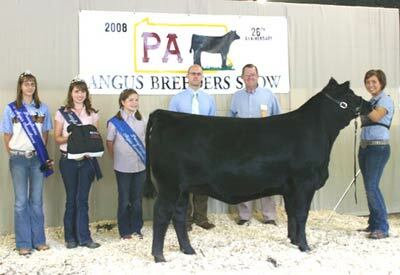 Rains Dream On 07RLE722 won reserve grand champion cow-calf pair at the 2008 Pennsylvania Angus Breeders Junior Show, July 3-5 in Huntingdon, Pa. Lindsay Upperman, Chambersburg, Pa., owns the January 2005 daughter of Bon View New Design 1407. A January 2008 heifer calf sired by Sitz Traveler 8180 is at side. Adam Hayes, Kingwood, W.Va., evaluated the 87 entries. Photo by American Angus Association. 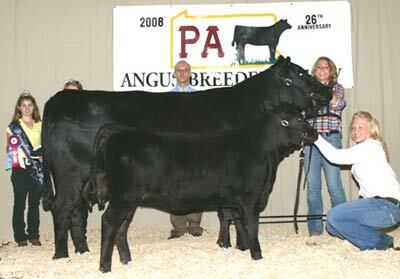 Just Enuff Langus Kryptonite won grand champion steer at the 2008 Pennsylvania Angus Breeders Junior Show, July 3-5 in Huntingdon, Pa. Suzanna Coleman, Shirleysburg, Pa., owns the April 2007 son of S A V 8180 Traveler 004. Adam Hayes, Kingwood, W.Va., evaluated the 87 entries. Photo by American Angus Association. 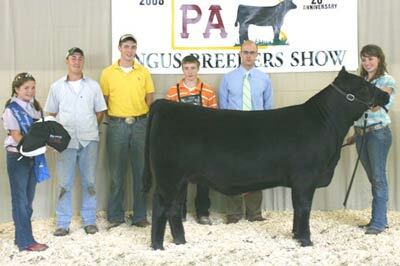 Rains Grid G T RLE won reserve grand champion steer at the 2008 Pennsylvania Angus Breeders Junior Show, July 3-5 in Huntingdon, Pa. Ryan Fairbairn, Coatesville, Pa., owns the March 2007 son of TC Grid Topper 355. Adam Hayes, Kingwood, W.Va., evaluated the 87 entries. Photo by American Angus Association. 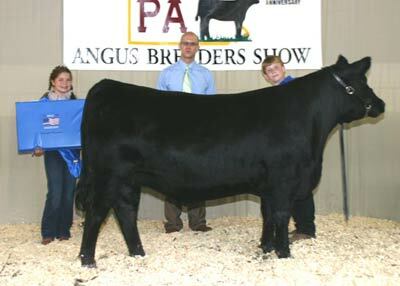 T A F M C T Maverick 710 won grand champion bred-and-owned steer at the 2008 Pennsylvania Angus Breeders Junior Show, July 3-5 in Huntingdon, Pa. Maria Trowbridge, Meshoppen, Pa., owns the April 2007 son of O C C Legend 616L. Adam Hayes, Kingwood, W.Va., evaluated the 87 entries. Photo by American Angus Association. WRN Final Frontier 806 704 won reserve grand champion bred-and-owned steer at the 2008 Pennsylvania Angus Breeders Junior Show, July 3-5 in Huntingdon, Pa. William Nichols, Tyrone, Pa., owns the January 2007 son of B/R New Frontier 095. Adam Hayes, Kingwood, W.Va., evaluated the 87 entries. Photo by American Angus Association. 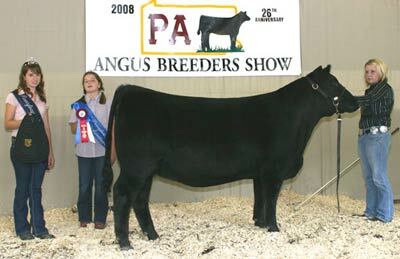 Weaverland Erica Janis 638 won champion spotlight heifer at the 2008 Pennsylvania Angus Breeders Junior Show, July 3-5 in Huntingdon, Pa. Andrew Cranmer, Butler, Pa., owns the winning heifer. Photo by American Angus Association. 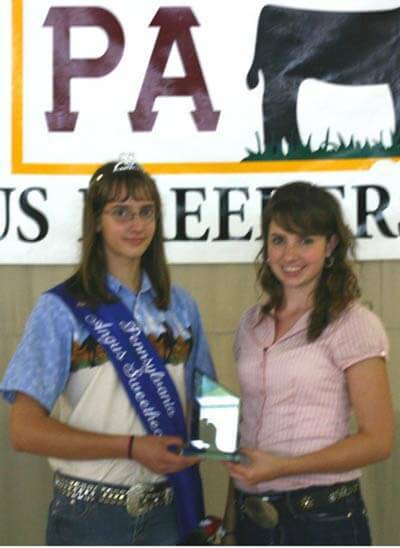 Katrina Frey, Quarryville, Pa., right, won premier breeder at the 2008 Pennsylvania Angus Breeders Junior Show, July 3-5 in Huntingdon, Pa. Elizabeth Trowbridge, Pennsylvania Angus sweetheart, left, is presenting the award. Photo by American Angus Association.